NEIU faculty, staff and community members peruse the recently published work of faculty members in Alumni Hall. 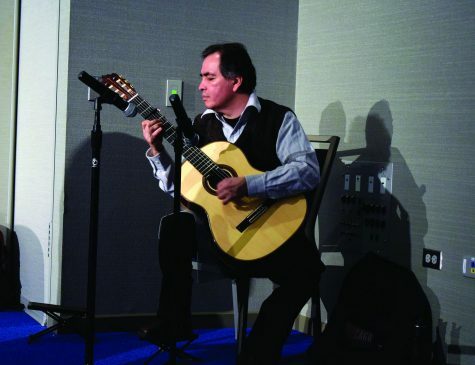 Dr. Brian Torosian, director of NEIU’s guitar ensemble, played guitar while the NEIU faculty, staff and community members mingled during the event. The gentle guitar music played in the background by Dr. Brian Torosian, the director of the NEIU guitar ensemble, as NEIU faculty members and community members mingled around the circular tables placed around the room. 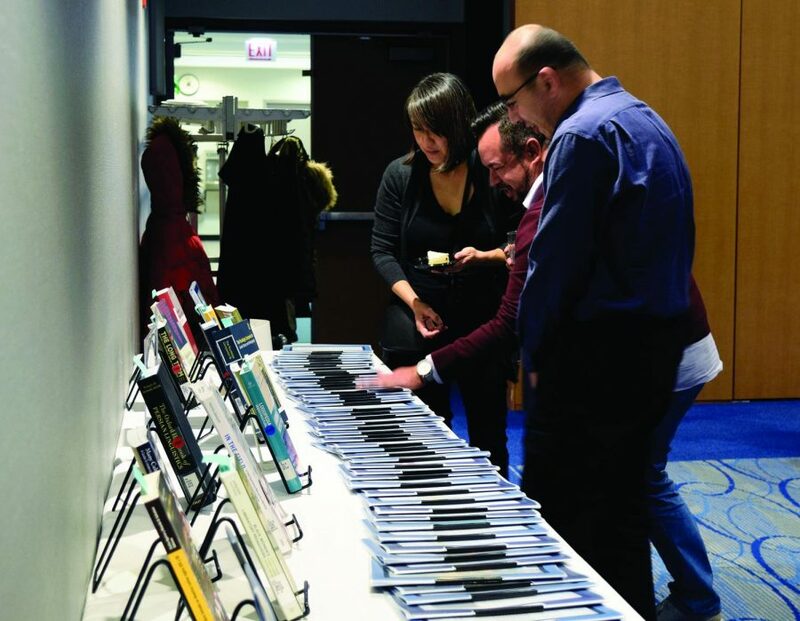 The annual Faculty Publications and Creative Works Reception kicked off on March 28 for NEIU faculty and staff to come together to celebrate and honor their peers who produced scholarly material and creative works in 2018. Refreshments such as meats, cheese, fruits, vegetables, pita bread, pastries and coffee were served. 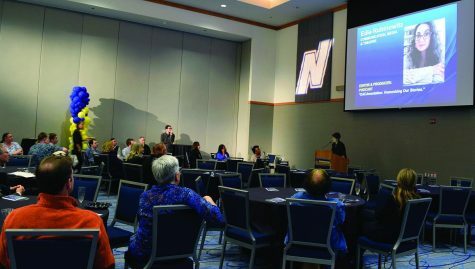 Lisa Wallis, Acting Dean; Ronald Williams Library; Bonnie Pfeiffelman, Library Administrative Assistant; and the Deans of the College of Arts and Sciences, College of Business and Management, and the Daniel L. Goodwin College of Education helped organize the event. Pfeiffelman made the extensive list of publications and creative works available for faculty and staff to browse and recognize. 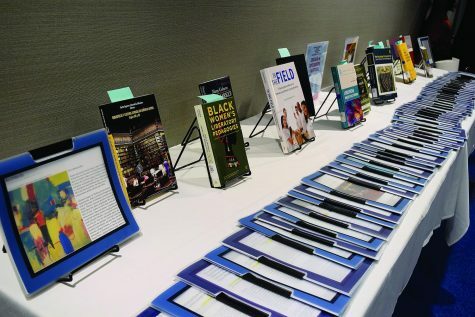 Dr. Gloria Gibson gave a speech recognizing all the time and hard work faculty and staff have put into producing publications and creative works. NEIU faculty, staff and community members watch a presentation about their peers and coworkers. The National Center for Education Statistics (NCES) reported that during the 2015-2016 academic year 18% of teachers in the United States reported income from other jobs other than their teaching job. The teachers in the midwest and the northeast region had the highest percentage of teachers with second jobs. Associate Dean of the College of Arts and Sciences, Tim Libretti; Associate Dean of College of Business and Management, Nont Dhiensiri; and Dean of the Daniel L. Goodwin College of Education, Sandra Beyda-Lorie gave their own speeches. They thanked and recognized the many works by the faculty in their college. A display of the NEIU faculty and staff publications available for viewing.